With the doom and gloom state of the economy and indeed issues that are pretty serious on a global level like climate change and the threat of terrorist attacks, trends associated to escapism are really relevant. The increase in gaming and the stable state of the holiday market, despite a global recession, are just two indicators that people need to balance out the bad stuff by doing things that feed the senses and make them feel good! In fact 80% of consumers said that brand experience is the single most important factor for repurchase (B&T 2012) – we really are turning into experience junkies. According to Mintel, savvy brands are already capitalising on different experiences and the merging of mediums. Consumers believe products that merge occasions or experiences, and that ultimately amplify the senses, add value – which is powerful stuff. In fact according to B&T, 78% of Australian consumers said they would be willing to pay a premium for a brand that offers a unique experience, and only 26% said they have had unique brand experiences in the past so there are many opportunities! So how are manufacturers and retailers responding to this need for new experiences and what things are they putting in place to inspire consumers to buy? How are experiences being merged? This is an area that has been bubbling for a while with the initial launch of the Pizza Express ranges into grocery around 2000 and their most recent launch of pasta sauces in 2010. Other success stories have been Cranks, which was rescued from administration by launching a range of sandwiches and ambient food in Waitrose and Holland & Barrett, and the Nando’s franchise. This trend is definitely on the rise with Wagamama recently launching their salad dressings, a follow on from their cookery book to re-enforced social engagement from restaurant to home. Other casual dining brands that have launched recently are: La Tasca which now has four Spanish sauces in Asda, Gourmet Burger Kitchen has a range of burgers in Waitrose and Wahaca is the latest launch with three Mexican table sauces. There have also been a plethora of chef endorsing brands like Heston range in Waitrose as well as brands like Charlie Bigham. Another way of connecting with the restaurant is through an implied place, with ranges like Morrisons Bistro range which really taps into this well. This is another interesting area on the rise with own label taking cues from KFC on chicken products as well as fast food formats for microwave chips and so on. However this trend has started to take hold in a more concerted effort and is responding well to the current economic climate where take-away is still a treat and therefore having the experience at a cheaper price is a welcome proposition. The Goodfella’s pizza does just that, it is blatant and in your face and is likely to be a hit – and you get wedges with it too! Brand owners are also using format in a clever way to signal the take-away occasion. Brands like The City Kitchen and the Dine In range by Veetee are fore runners of this successful strategy. Another visual signal of the take-away experience that also taps into the ritual imposed by the pack format which again brings the consumer closer to the social experience of the takeaway without stepping out of their homes. Other brands that are tapping into this need for merging to create new experiences are kids brands that are really promoting play. Magic Choc which actively encourages kids to play with their food to create chocolate sculptures that they can eat and also Puzzle Guzzle which invites you to find ‘your fruity formula’. 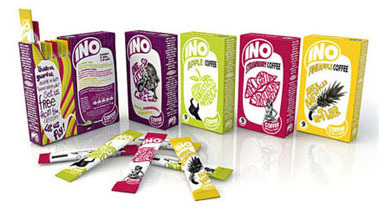 INO fruit coffee has entered the market with what feels very much like the territory of herbal tea instead of coffee and indeed the sachets look like something out of the yogurt category, more akin to brands like Frubes – an interesting clash of experiences! We also have brands that are merging two things that go quite well together. 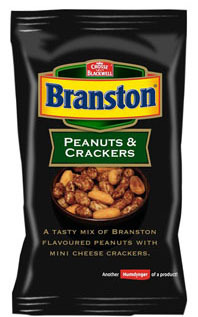 For example, Branston has merged the ritual of cheese, pickle and crackers on a cheese board made into a snack to give that sense of the experience or a way to experience it differently. And finally something that you find in the soft drinks isle but delivers the experience of something from the dairy isle. Turbo Tango’s aerosol can, which is used by squirting a foamy liquid into the mouth – a definite clash of two things to create a very different and unique experience. How to embrace this trend? Audit your market – Keep ahead of the game when it comes to identifying usage occasions. Look at keeping ahead of new developments within restaurants, abrs, fashion, beauty treatments, gaming etc. This can help to feed your pipeline and identify possible brand tie ups, combinations, rituals and so on. Take inspiration from within – Look at what is in your company’s portfolio of products and identify if there are any perfect matches. Premier Foods are particularly good at looking at and creating connections from within the total portfolio when working on innovation e.g. Branston Baked Beans and Ambrosia Jelly Puds. Give a reference point – Being the first to market is not always plain sailing as trying to get consumers to understand and engage can be difficult, especially if a category is being established. Yakult is a good example of this, it launched in a bit of a ‘no mans’ land and therefore was hard for consumers to understand – Is it yogurt or medicine? Where is it from? When should I use it? etc. However when Actimel launched in the yogurt fixture, consumers engaged with it immediately as a yogurt based one a day shot to aid stomach health – easy!